The design carpets for SCANDIC Stavanger Airport were inspired by the oil business – one would perceive the carpet as a map of undiscovered oil pockets. Arkitekter, one of Scandinavia’s leading architectural practices. Hipas Design was in charge of the design of all rooms and corridors, whereas Stay AS designed all public areas; including the huge 16 x 24 meter atrium and the stylish lobby. The SCANDIC Stavanger Airport hotel (former RICA Hotels) has a unique location just steps from the arrival hall of the airport. The stunning scenery, especially the nearby Sola beach, was a great source of inspiration for the designers – who also incorporated elements from the city’s big oil business. 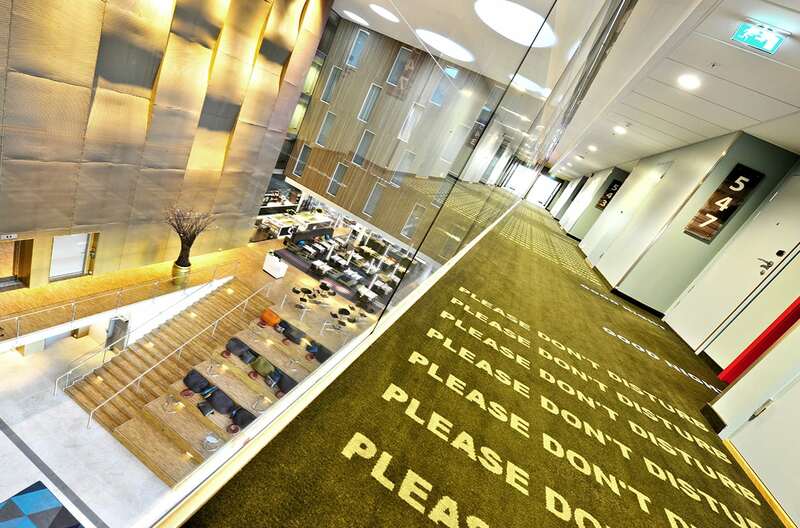 This is clearly expressed in all rooms and also on the wavy walls in the atrium. The interior design of the hotel is very international and modern. 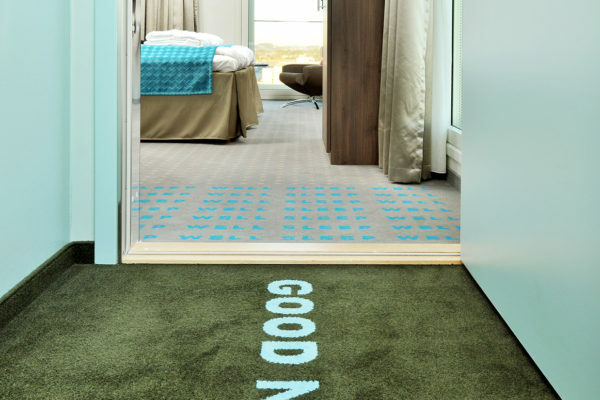 Some carpet designs include wordings that direct the thoughts to the certain atmosphere and tranquillity of a hotel room. In the design process Hipas constantly strived to express new colour combinations based on Dansk Wilton’s existing design inspiration. Moreover, they created their own designs when they needed the carpet to intensify the interior concepts. 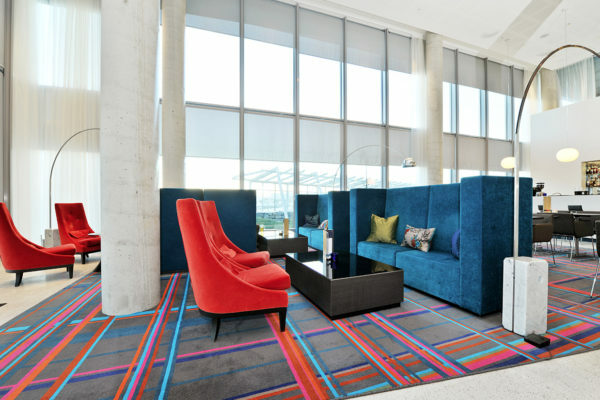 The SCANDIC Stavanger Airport hotel has 188 rooms and 10 meeting rooms, all contemporarily furnished to match the needs of the modern businessman as well as holiday visitors. Heating of the hotel is climate neutral, since heated water from a wood chip fueled bio heating plant provides for heating of both domestic water and the hotel itself. 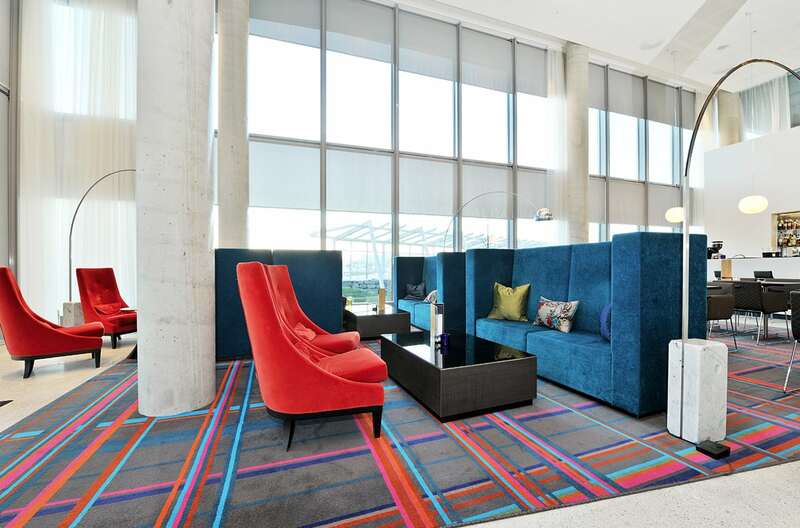 Dansk Wilton delivered all the custom design carpets for the SCANDIC Stavanger Airport hotel.